great to have spoken to you. I am looking at doing a serious potraiture of an indian musician. 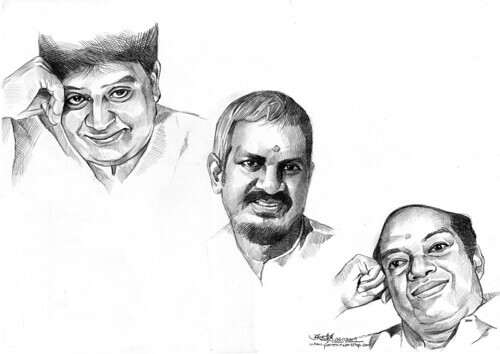 a pencil sketch, a4 size. I would like the full shading rather than a simple sketch. I'm curious as to the paper u use since some of the shades seem more dynamic with textured paper. Im not sure if its the paper or just ur style, but i hope to see some deep blacks and a range of shades. .....i'd like to do a portrait of the 3 photos i sent in my last email, on A3. Please use them as reference. I can make the 50% deposit later in the evening. For the picture of the man with the mic (his initials are SPB), appreciate if u can draw him without the mic. For the other man (his initials are K), appreciate if u can draw him more clean shaven, think there's a bit of nose hair as well! i am attaching more reference pics to help u. since its all stand alone pictures that i'd like drawn together, u can be creative in making them all part of one piece. 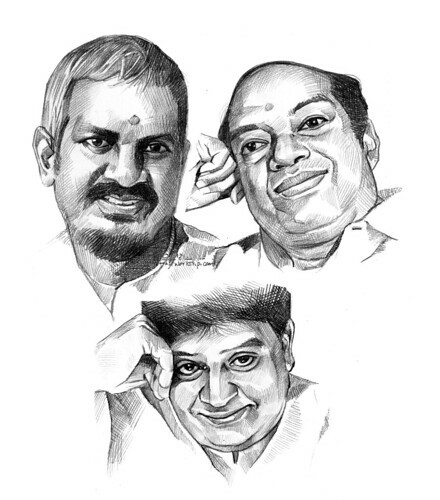 For your own information, they are all legendary tamil musicians (lyricist, singer and composer) and i'd like to remember them through this portraiture." Thinking of how to put 3 of them together aesthetically on 1 drawing. I played around with the layout digitally, after the original artwork is being drawn. This could be another better version.